Lebanese rice is such an essential part of our table that I’m sheepish that I haven’t shared it here before…. My mom’s version is so special and delicious that it’s as at home on your weeknight menu as it is the holiday table. About half of her calm nature (the other half, all Dad). A petite frame (but NOT the silken black hair, darn it). A fascination with the world of Lebanese cuisine, and her many ways of making food taste delicious. Mom’s Pie Crust (Thanksgiving necessity). And not just the crust, but the rope pinching move she uses to crimp the pies. When it comes down to it, crimping the crust in the way she taught me is one of my life’s pleasures. Sheik al Mehsheh topped with mozzarella cheese. Brilliant woman. Cranberry sauce studded with walnuts and fruit, made and eaten, then made and eaten again, and then again and again, from November 1 through January 1. Oven fried chicken. This impacts our lives the most (well, that and the unfailing love that is never, ever anything but kind—that too) because we make it so often. I see why she did too, when we were growing up. It comes together fast and always tastes wonderful. Grandma’s cookies. A spice cookie studded with dried apricots and raisins (no, I haven’t shared this one yet). Deep golden brown color on the baklawa, which we will discuss here very soon. 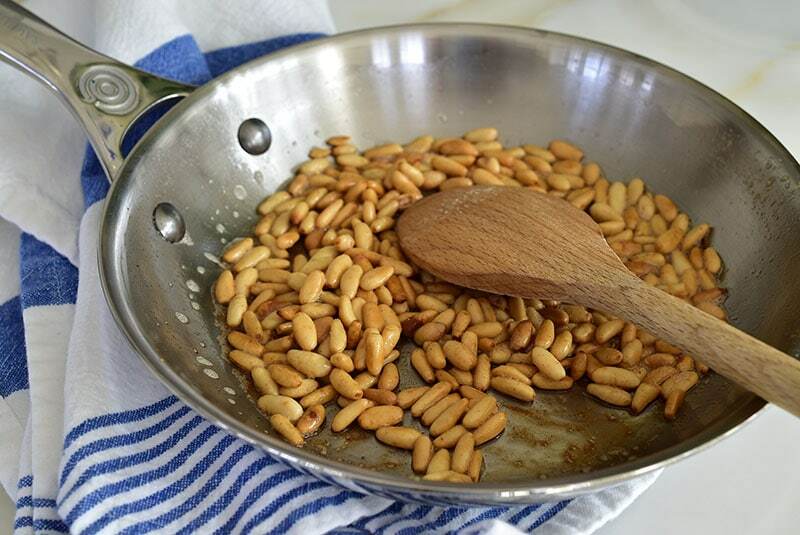 Toast all of the nuts when you do it, then freeze them in little baggies that way. Now they’re ready when you are for rice, salads, hushweh, all of it. Not a recipe, but a trick of her trade. 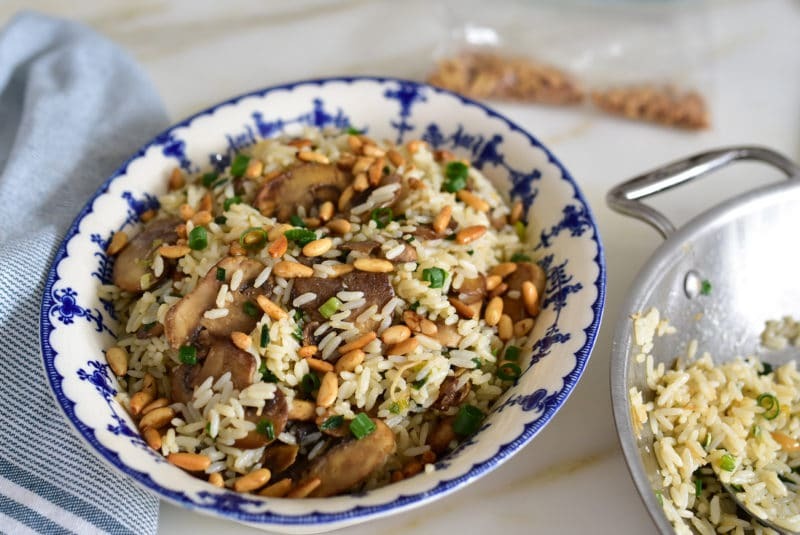 Mom’s Special Rice, a mélange of Lebanese cinnamon-scented rice with mushrooms, scallions, and a shower of toasted pine nuts. The list does not end (oh, the chocolate buttercream which never turns out grainy but did in those photos…), but we’ll pause with it here because I feel a tremendous responsibility for not having shared the rice with you as of yet. The Grandma’s cookies held close to the vest I don’t feel as badly about (they’re good, but they’re spice, and in my world spiced sweets rarely win; here’s how I feel about that). But the rice? 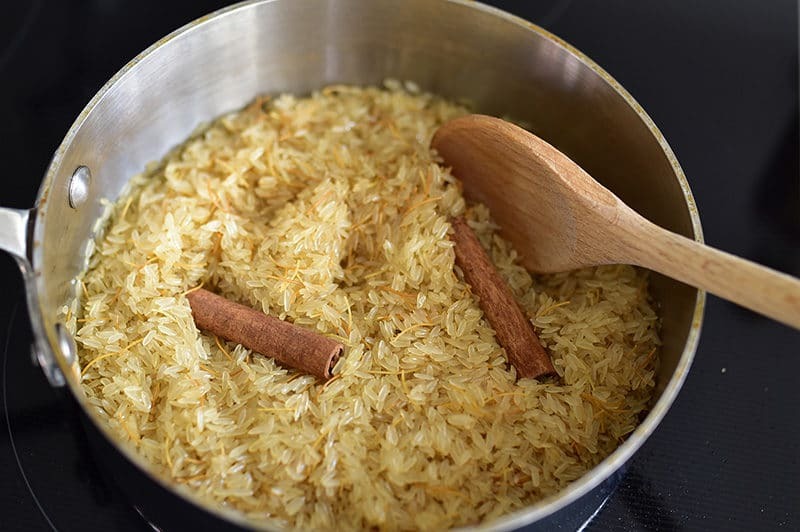 Lebanese vermicelli rice scented with cinnamon is the basis for so many plates that keeping our version of the rice from its fully realized life out here with you is…criminal. Mom has always studded the already delicious, simple Lebanese cinnamon rice with the incredibly savory addition mushrooms, garlic, scallions, and pine nuts. She uses Uncle Ben’s rice, without apology (you can use basmati or any long grain rice and it will cook up just fine). You might want to start auditioning Mom’s Special Rice right now for Thanksgiving and Christmas, because it’s as weeknight-worthy as it is holiday table. Meanwhile, I’ll keep at my list to see what other Mom-treasures need to see the light of day here with you…. 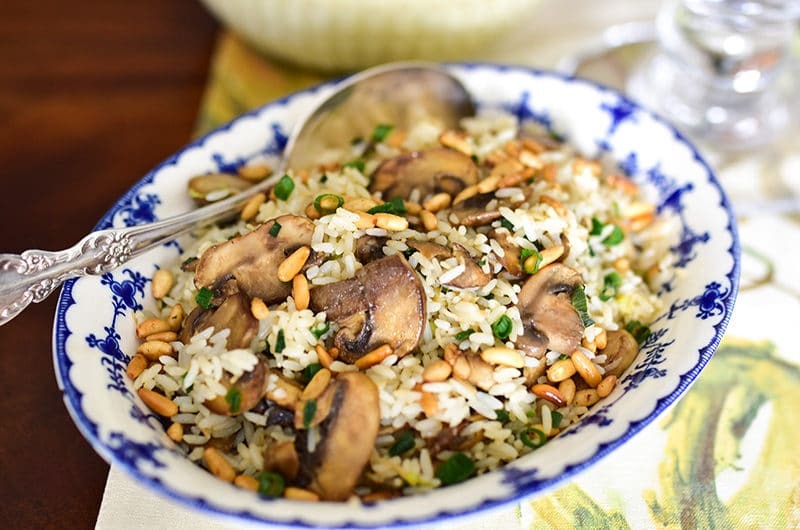 28 Responses to "Mom’s Special Lebanese Rice"
We use ground beef instead of mushrooms. Delicious. We use ground beef in hushweh, very similar and yes, so delicious! Hi Maureen, Lovely recipe. I do one similar, omitting mushrooms and substituting raisins/golden raisins (= sultanas, this side of the water!) and Lebanese 5 spice mix for the cinnamon. If I am feeling lavish, I throw in ground lamb as well. And I always cook mine it in chicken broth for the richness. Obviously the lamb/chicken broth makes it unsuitable for vegetarians. But it is lovely…. 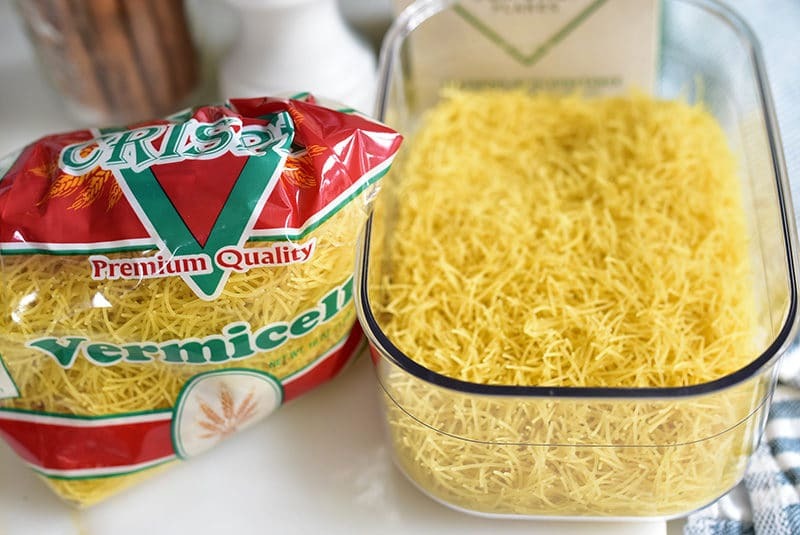 Do I use the vermicelli sold in the Italian section of the supermarket? I had a simplified version I used to cook for my room mates in college, included cut up Cornish hens. Haven’t done for a while. Have to try this! Love it and love your mama ❤️! My mother always used chopped/diced lamb & beef that she diced by hand (she would never use ground). She would always bring a large pot to my house for Thanksgiving dinner! It’s one of my favorites! I also use diced lamb and basmati.! Thanks for sharing! Just made this rice dish last night. It’s DELICIOUS! I used jasmine rice and baby bella mushrooms. I can’t wait to serve it again to friends and family. Thank you for sharing the recipe. Love the recipe. 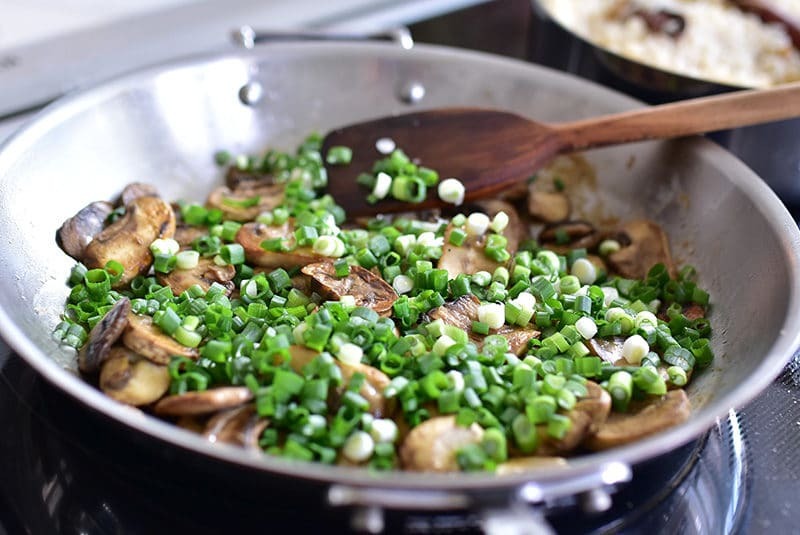 I do the same thing and I will embellish with what is available and appeals given the rest of the meal … sometimes mushrooms, sometimes raisins, sometimes parsley etc. But what really stood out to me was your comment about other creations, “Sheik al Mehsheh topped with mozzarella cheese. Brilliant woman.” First, you are right, simple but brilliant! I love to take the original dish and add some twist from another culture and I have done that many times with Lebanese food; especially because I am living in Lebanon presently and at times I have difficulty finding ingredients for American and/or other dishes not Lebanese. So, I have taken to using the original Lebanese recipe and putting another cultural twist on it to satisfy my craving for, say, Mexican. You would be surprised how resourceful a woman can be when faced with a craving! Just discovered your blog and I will follow it to see what you are up to. I am also from Michigan and love the northern part of the state … especially northwest. Adding this to my Thanksgiving menu Maureen, looks delicious! I hope you and your family have a wonderful holiday! Just made this, it was delicious! I love the subtle flavor imparted to the rice/vermicelli by the cinnamon. As a vegetarian, I’ve been stuck in a beans and rice rut, so this was exactly what I needed. I also added thinly sliced brussel sprouts which were a delicious addition (and gave more lovely color). I will definitely be adding this to my repertoire, I can see this being a great base for any number of sauteed or roasted veggies. Putting together my menu for thanksgiving and saw this post. Looks great! One question can this be made a day ahead and reheated? Hi Dorie–yes, just add a little chicken broth or salt and water to the rice mixture when reheating. And hold off on adding the nuts until just before serving. How can I purchase just the mint salt without garlic separately? Do you have a local store to make purchases? Hi Joyce–when you place your order for the set of Mint Salts (here), indicate in the gift message field that you want two Favorite Mint Salts, without garlic. You’re going to love the mint salt! We’ll keep an eye out for your order and I’ll make sure it’s with mint salt, no garlic. Last night I served it with your recipe for stuffed baby eggplants, and it was a big hit. I rinsed the rice, and didn’t soak for long, and cooked it with less water and with the lid off, and it didn’t get mushy. 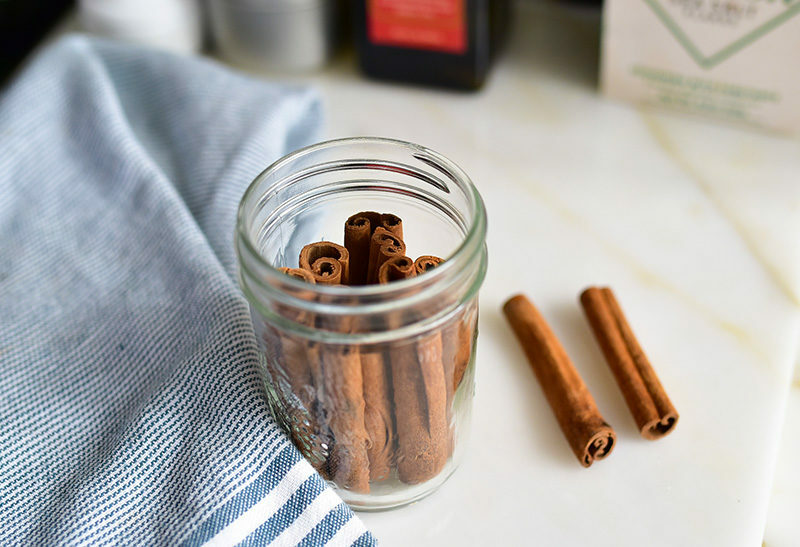 I added a bit of curry this time– just to experiment– but I do prefer the cinnamon flavor. Your recipes remind me of the many wonderful dinners Mary served us—and that taught you so well. Precious memories ! Aunt Anne, this is very interesting–I would soak other rice but haven’t soaked the Uncle Ben’s rice. Sometimes, it’s mushy. So I’ll try rinsing! Thanks so much for your note and tips! I’ve never had it with mushrooms, looks delicious! Our family used to use very finely chopped gizzards. Thanks for sharing!